It was over ten years ago when DT Swiss first entered the suspension market. After purchasing Pace’s suspension fork designs and technologies in 2006, DT Swiss retained the characteristic reverse-arch design of the original Pace forks, while updating internals to offer a wider variety of options to a bigger global market. 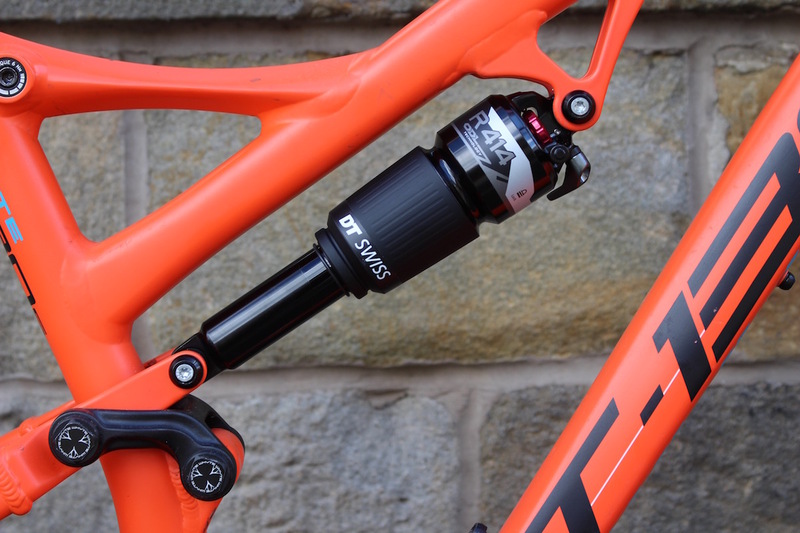 Aside from lightweight carbon-dressed XC forks, DT Swiss has gone on to manufacture rear shocks too. 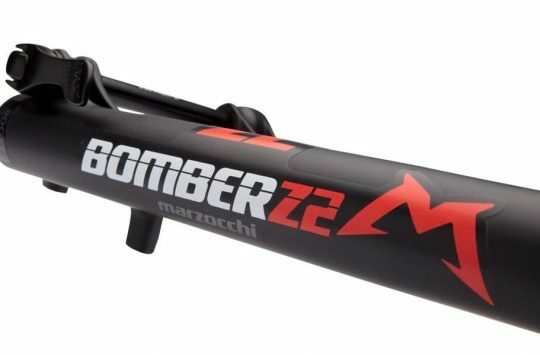 The previous offerings have often been on the XC racing side, with carbon fibre air cans and such being used to keep the weight down nice and low. 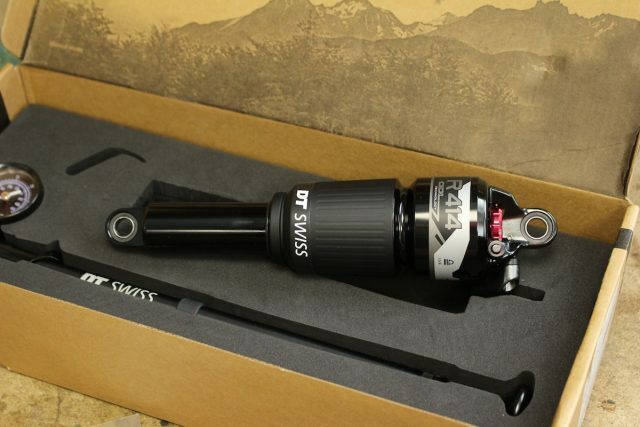 You would have likely seen DT Swiss shocks on previous Scott mountain bikes, including custom designs employed for the Spark and Genius models. Though aside from some smaller European brands, you won’t see a whole load of big brands using DT Swiss rear bouncers. 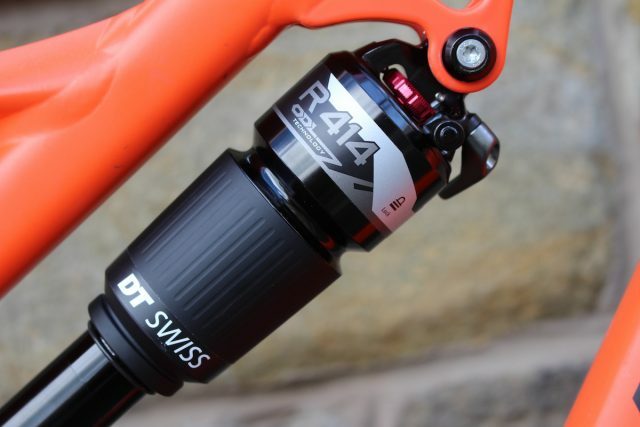 DT Swiss is looking to turn that around, with its new R 414 rear shock that it first exhibited at Eurobike last year. 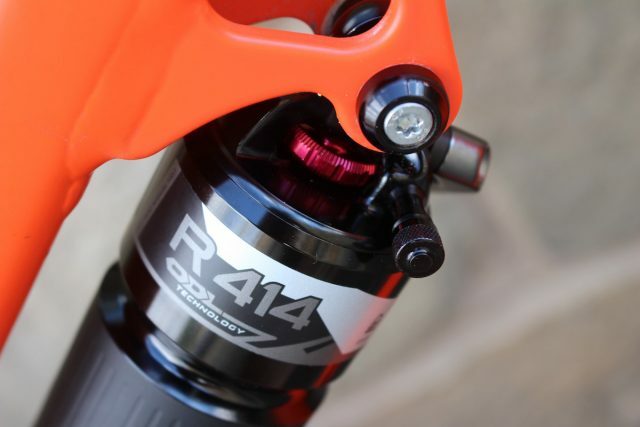 Designed for use on everything from XC race bikes through to long-travel enduro bikes, the R 414 features a new larger air can with a higher volume negative air spring, much like RockShox’s DebonAir and Fox’s EVOL air cans. We recently received a new R 414 rear shock from DT Swiss, which we’ll be testing aboard the Whyte T-130 longterm test bike. A spangly new boinger for a’testin. “R 414 is an acronym and stands for fast trail riding. Well, not really, but that’s what this shock is all about. It’s elegant conical shape integrates a large negative air chamber for super supple action which is further enhanced by a low resistance compression piston. With trademark DT Swiss reliability and lightweight, the R 414 sure will push you to try new lines and crush your KOMs” – From DT Swiss. The R 414 is a new rear shock from DT Swiss, and it’s designed to cover everything from XCO racing through to trail and enduro riding. The shapely air can houses a new larger negative air spring chamber that helps to deliver a smoother, and more linear feel. Or at least, that’s what DT Swiss says anyway. 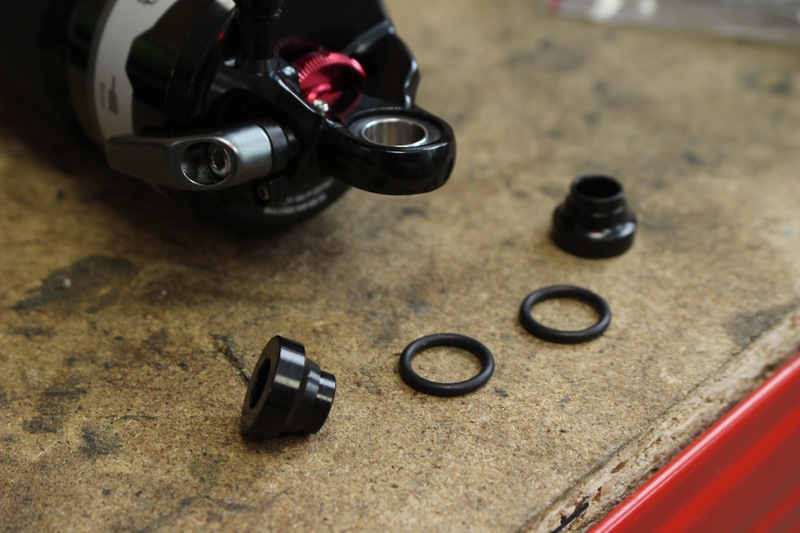 Available in six different sizes, the smallest R 414 shock comes in a 165x38mm size, which is a popular dimension for short-travel XC race bikes. Before the Scott XCO race team moved to a full SRAM sponsorship for 2017, the team utilised the DT Swiss suspension package on its Olympic-winning Spark race bike, complete with an R 414 rear shock. 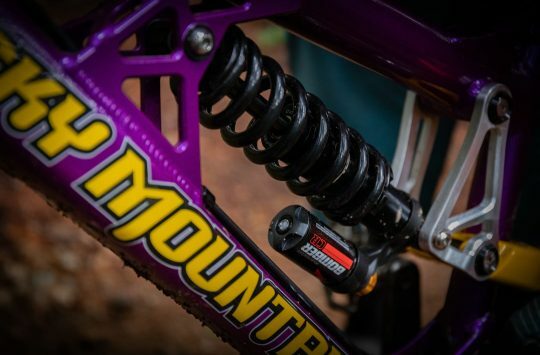 However, with its larger negative air volume, the R 414 shock is also being marketed for trail and enduro bikes too. Our test shock is the largest size DT Swiss currently offers; a 216x63mm size, and it’s paired to the 130mm travel back end of the Whyte T-130. However, as an example of what it could be used for, the 160mm travel DMR SLED we’ve just finished testing also uses the same shock size. This image is of a different shock, but it shows you the two air chambers (positive & negative), as well as the transfer port between the two (notch). 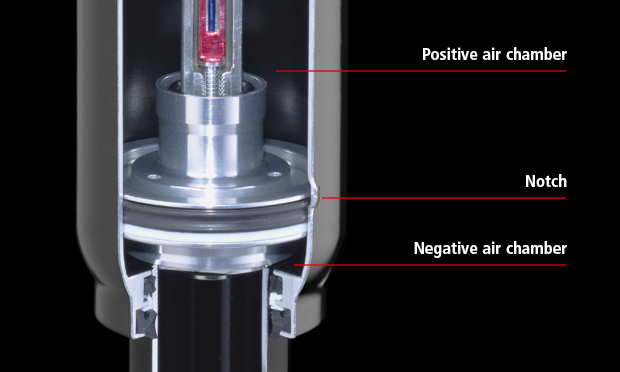 The biggest change that the R 414 brings over previous DT Swiss shocks is its enlarged negative air chamber volume. 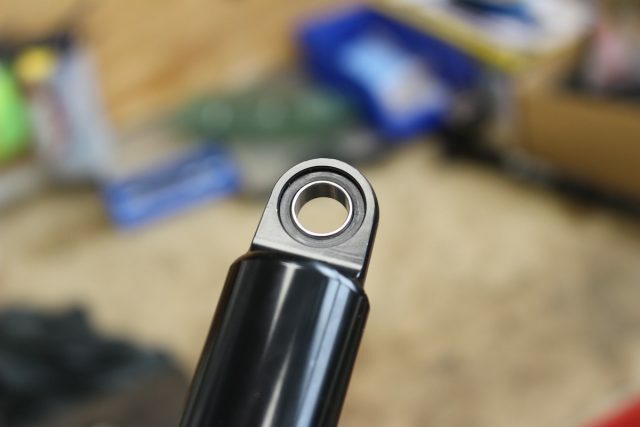 Designed to achieve a more linear spring curve like a coil spring, the negative air spring is meant to help the shock ease into its sag point for a more supple off-the-top feel for the rear suspension. The red rebound dial sits at the head of the damper, and is designed to be adjusted with one’s fingers. 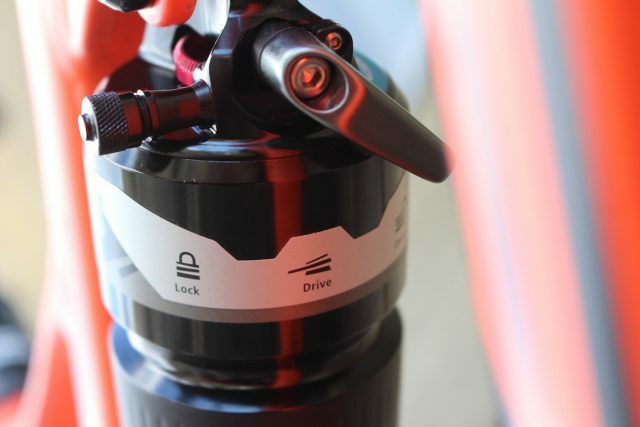 Three-position compression adjustment, with Open, Drive and Lock settings. A remote upgrade is available for those who love cables. All-black anodized stanchion and neat hardware for the R 414 shock. Whereas most brands use bushes for the shock eyelets, DT Swiss uses spherical bearing eyelets instead. And it’s all in the name of reducing friction for a smoother feel. 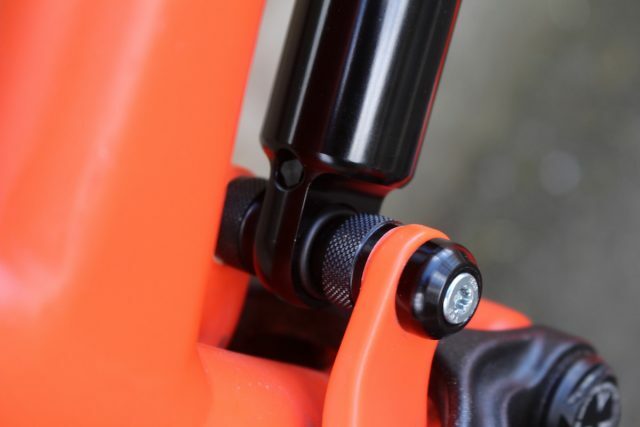 The top mount uses O-rings and press-in spacers. 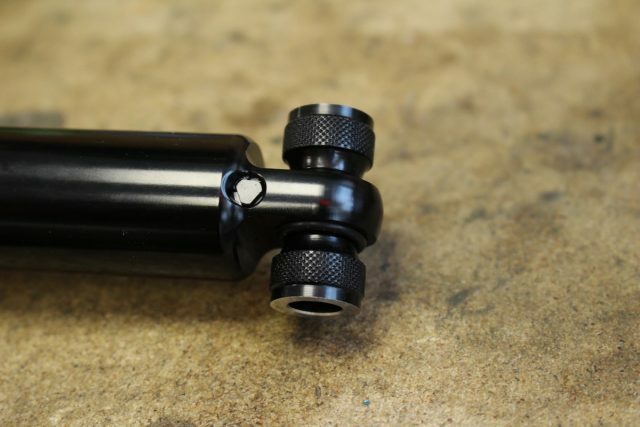 The wider bottom mount uses a steel shaft through the middle, with threaded black spacers on either side keeping it all together. 301g without hardware and for the biggest 216x63mm size. We’ll be performing plenty of back-to-back testing with the new DT Swiss R 414 rear shock to see just how well it stacks up against its competitors. For those who’d like more information on the shock, you can head to the website of UK DT Swiss importer, Madison, for all there is to know. the prices are getting stupid. @mboy – first impressions are good so far, though we’ll keep you posted! @toymotor – not really. 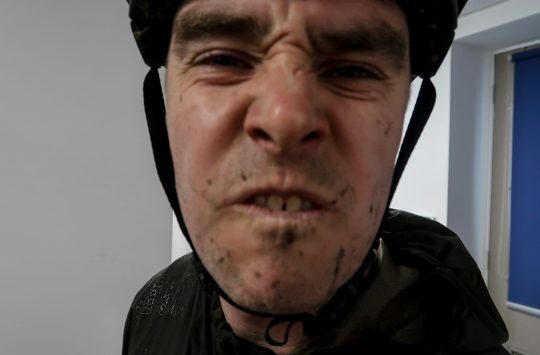 A RockShox Deluxe costs £385, a Kashima Fox Float DPS shock costs £479, and a DHX2 costs £639. 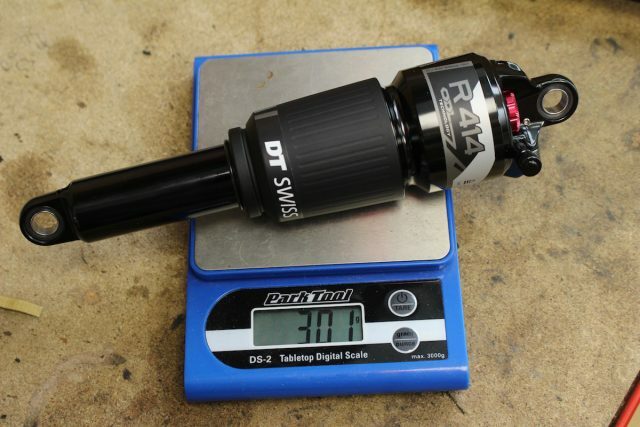 So the DT Swiss R 414 shock is actually very well priced compared to the competition.